There are now 117 Walkers are Welcome towns in Britain . Bigger towns are beginning to see the benefit of being a WaW town leading to a proposal to increase the annual subscription which was not enthusiastically received. About 50 people attended. They had encouraged towns to complete a quilt square with images that represented your town. Lizzie and Louise Lockhart, artists who live in Hebden designed the HBWA quilt square. Mytholmroyd Walkers Action also submitted a quilt square, sewn and completed by their committee members. They now form part of a banner that will be brought out for the annual conference and other special occasions. I attended two workshops – Media, PR and partnerships and Financing your group. Both generated a lot of discussion on the use of media and social networking and what organisations may provide funding for groups. This encouraged me to think about developing the use of social media to publicise HBWA and the need to keep our website regularly updated. Delegates were entertained by walks on Saturday morning around the town. In the evening Chepstow male voice choir heralded the start of the dinner, followed by a ceilidh. Walkers are not great dancers though, a few toes were squashed. Next year’s conference will be held in Sidmouth . We agreed that we are going to work with a group of Todmorden walkers to apply to Metro to produce a booklet of walks from Todmorden buses. This will be part of a wider Walkers are Welcome initiative. We agreed to give away the current stock of gentle walking leaflets and to consider re designing them next year. This is what you see where the Pennine Way arrives West of Hebden Bridge! 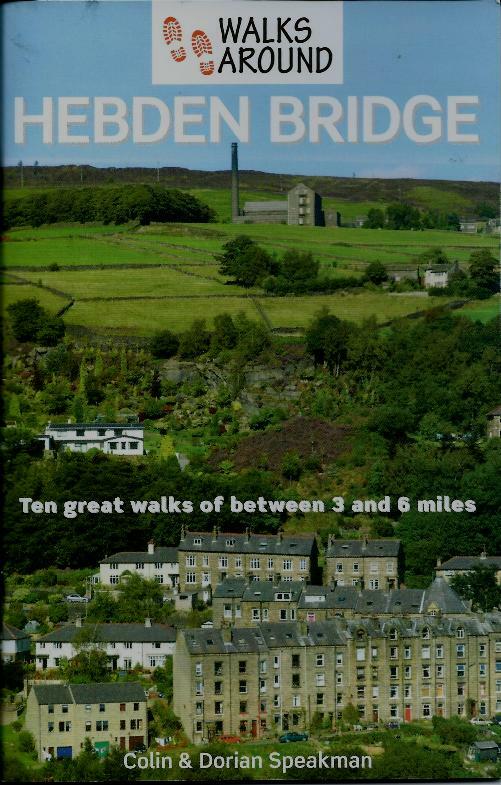 Hot off the press, ten walks around the area, between 3 and six miles with easy to follow instructions and specially drawn maps. The pocket sized booklet costs £2.99 and is available from Tourist Information and other outlets. At the last meeting of HBWA, it was agreed to go ahead withn this project which has been requested by the two visitor centres. HBWA will be applying for funding from a range of sources with Bradford and Calderdale. We hope to know whether we have been successful in September. 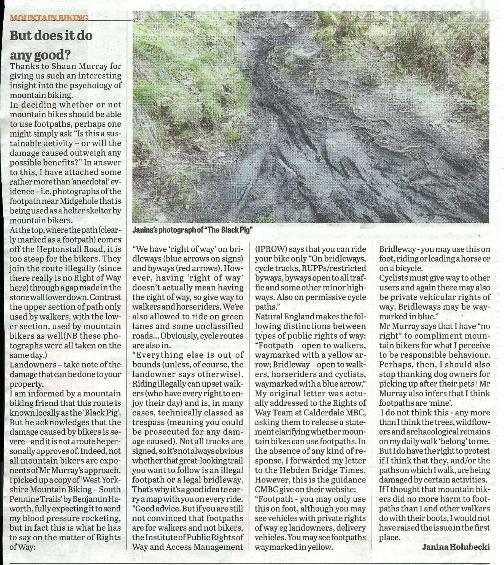 The Hebden Bridge Times has had a lively debate about the effects of mountain biking on the footpath netwrork. We have included the latest piece below to stimulate debate. A 3 mile leisurely walk around the dams at Blackstone Edge, fantastic views and a visit a Stanza stone. Start on the 901 bus from Hebden Bridge Railway Station at 12.03pm to the top of Cragg Vale. Lunch stop at the White House pub. Return on the 901 bus at 3.45pm to Hebden Bridge . 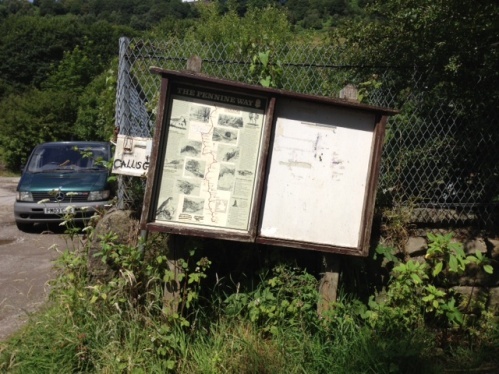 A 3.5 mile walk down Hardcastle Crags to Midgehole or Hebden Bridge (5 miles). Start on the 906 bus at 11.12am to Widdop Gate from Hebden Bridge Railway Station. Lunch stop Muddy Boots café, Gibson Mill. 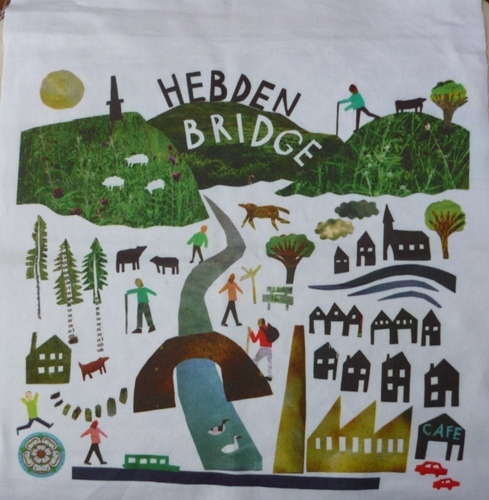 Return to the station by walking into Hebden Bridge or on the 906 bus from Midgehole. An 8 mile walk from Blackstone Edge to Hebden Bridge , down the Pennine Way . Start on the 901 bus at l0.10am from Hope Street bus stop Hebden Bridge to the top of Cragg Vale. Lunch stop will be on the route, so bring food and drink. The walk finishes at Hebden Bridge . Splat training is a new company based at Blackshaw Head, in Hebden Bridge offering Hill Skills and Navigation, fun Guided Walks and First Aid training courses locally. For more details, look at their website. The routes have now been agreed, directions written and mostly checked – we are working on a deadline of the end of March to have all the copy sorted. Some of the route improvements have started and some of the maps are being drawn. We have been asked to design walking routes on to the Tour de France route. We are only using tracks and robust paths as the numbers thought to be coming are huge. The five routes have been completed with detailed directions. At this stage we don’t know what kind of format they will be published. This is on Friday March 21st at Hebden Bridge Trades Club. 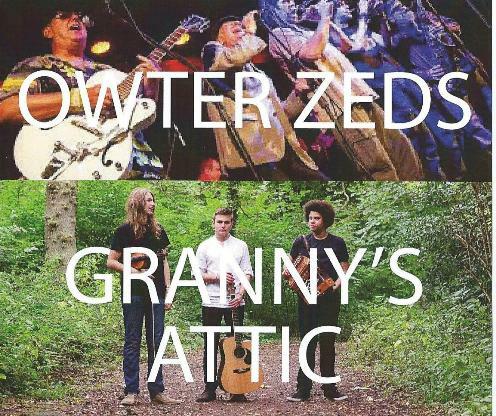 You can get tickets from Blazing Saddles, Mountain Wild, Trades Club, The Bookcase, Todmorden TIC, and on line from We’ve got Tickets. Teddy Toddle & Ogden Stomp Sunday 16th March. This is a family walk in aid of Overgate Hospice. Face painters, teddy bear quiz and refreshments. Join us on Sunday 16th March any time 10:30am – 12:30pm for a stroll around Ogden Reservoir with your favourite teddy bear. Adults £3.50 and under 16’s £1.50 before the day registration or on the day £5.50 adults & £2.50 children. Also on the same day is our 3 mile Ogden stomp. Meet at the Ogden classroom. We have secured money to promote the 901 as a walkers bus (as we did with the 906). This is particularly welcome as the 901 is now running on Sundays. The launch of the walk booklet is planned for Spring Bank weekend. The 906 is confirmed as running in 2014 and a relaunch of the walk booklet is planned for Spring Bank weekend. Health Improvement Service are running a series of walks ovr the summer.